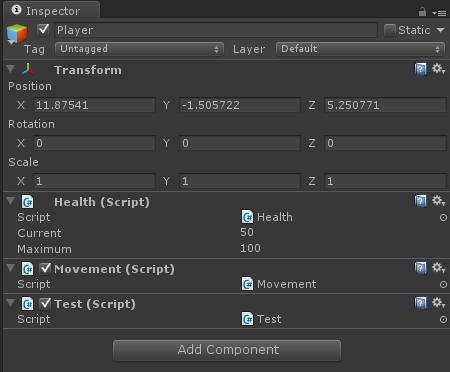 Unity is a component based game engine. This article will explain what that is and how to work with it effectively. In Unity a GameObject is pretty much just an empty object. It's the base for everything else. It's just a raw object that has space for components. A GameObject itself does nothing unless we add components to it. So basically every time we want to add something to our Unity world, we create a GameObject and then add components to that GameObject. 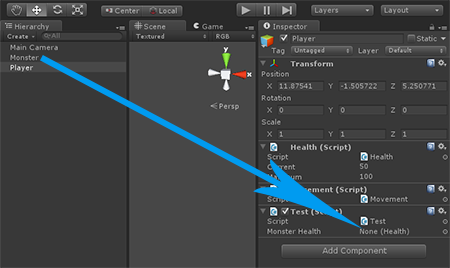 In Unity, components can be Scripts, Sounds, Meshes(3D models), RigidBodies, Colliders and more. In the example above, Health, Skills, Movement, AI and GUI are probably Scripts. This raises the question: why don't we just create a Monster script and put it all into that, instead of breaking everything down into components? 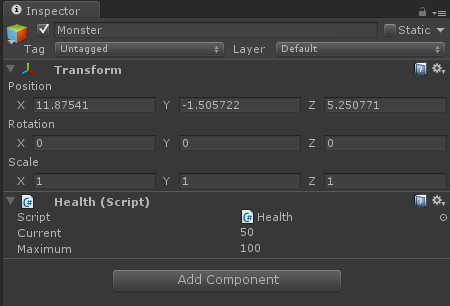 Now here comes the beauty of the component based system: we can reuse components that we used for the monster! So all we have to do to create a Player is use most of the components that we used for the monster before (like Health), add them to the Player, add a few new components (like Sword and Shield) and then we are done already. This saves us a whole lot of work in compare to creating a single Player script where we would have to program everything again. That's it, simple as that. It's just a clever way to save us from doing too much work. Now apparently dead people can't move, so how do we stop the Movement component from doing its work while the Player is dead? We need a way for the Components to communicate with each other. Obviously they are on the same GameObject (the Player), so there has to be some way. Note: this means 'Get Component of type Health'. That's it. 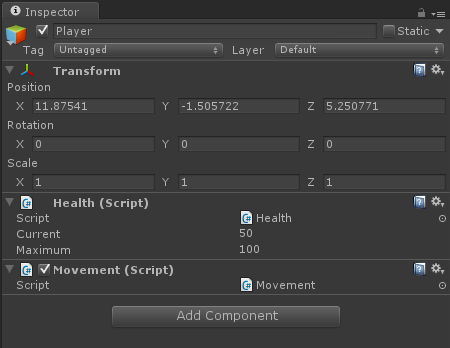 All we have to remember is that Components on the same GameObject can access each other via the GetComponent function. Okay so the question is, how can Components communicate with Components on other GameObjects. 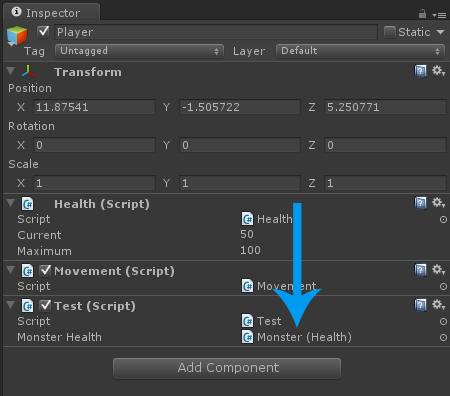 For example how could we access a Monster's Health from within a Player's script? Our GetComponent function from above only works for Components that are on the same GameObject, so we need to figure out something else. // ToDo: is monster alive? 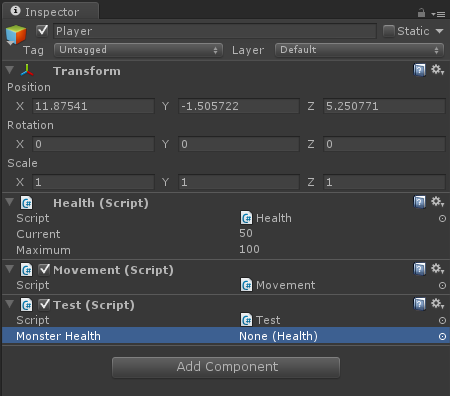 So the question is, how do we access the Monster's Health from within the Player's Test script? If we look at that for a second, we soon realize that it makes no sense at all. The monsterHealth component is **null*, so accessing it is a bad idea. Which means that our public Health monsterHealth variable, points to the Monster's Health now. Hence we our Test script works. That's how we access Components on other GameObjects!